The Tasmanian devil is the largest of the marsupials that eat meat. They were once found all over Australia, but are now found only in Tasmania. They were probably driven south by the dingo when it came to Australia, at a time when Tasmania was joined to the Australian mainland. The Tasmanian devil is the world’s largest surviving marsupial carnivore and is only found in the wild in Australia’s island State of Tasmania. The devil has a thick-set, squat build, with a relatively large, broad head and short, thick tail. The fur is mostly or wholly black, but white markings often occur on the rump and chest. The Tasmanian devil cannot be mistaken for any other marsupial. Its spine-chilling screeches, black colour, and reputed bad-temper, led the early European settlers to call it The Devil. The survival of Tasmanian Devils is threatened by Devil Facial Tumour Disease (DFTD), and the species is now listed as Endangered. DFTD causes tumours around the mouth, face and neck of Devils. The disease develops rapidly and is fatal: affected animals die within six months of the lesions first appearing. Only the north-west remains undiseased. There are indications that the devil populations in the north-west have slightly different genetic composition from those in the remainder of Tasmania and may perhaps harbour some individuals with genotypes resistant to this lethal disease. Tasmanian devils play an important role within the Tasmanian landscape and specifically, its ecosystem. As such, one of the challenges for the Save the Tasmanian Devil Program is the management of the ecological impacts of a reduced devil population and the minimising of adverse repercussions. Tasmanian devils decrease blow fly numbers by cleaning up carrion and dead animals from the landscape. Mines proposed in north-west Tasmania could devastate populations of undiseased devils, says Hamish McCallum, head of the Griffith School of Environment at Griffith University, Queensland. Both Environment Minister Tony Burke’s press release and his approval of 18 December 2013 explicitly recognise the threat that this mine will pose to Tasmanian devils: the developers are required to donate $350,000 to the Save the Tasmanian Devil Program Appeal to compensate for the mine’s “unavoidable” impact. Survival of the Tasmanian devil now rests on the success of the captive breeding program. The Tasmanian devil, the world’s largest remaining marsupial carnivore, faces extinction in the wild. A group of genetically different animals, once hoped to be resistant, are succumbing to the disease, and hope of naturally resistant animals in the wild is fading (although a tiny glimmer of hope remains with five animals who are still seemingly healthy after tumour regression). Like for all of our native animals, extinction is an incremental process, and competition with developments and diseases are taking their toll. Australia’s mammal extinction rate continues at world-record standards, but not something we can be proud of. Dr David Obendorf, Wildlife Veterinary Pathologist, contributes the spate of Tasmania’s wildlife diseases to human abuse of the environment – pesticide and herbicide spraying, biocide contamination of streams, the continuation of habitat fragmentation and habitat destruction, allowing these diseases to be transmitted more easily and compounding pathogen stresses on wildlife. Chemical pollution may be factor in deadly disease ravaging Tasmanian devils, says? European Journal of Oncology. 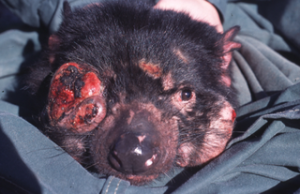 Devil Facial Tumour Disease (DFTD), has resulted in species being listed as endangered.